Community. Community is essential for building resilience in life. Everyone at Wyllie Taekwondo is treated equally, with courtesy and respect. Our positive and supportive community means that everyone has a place where they belong and no one is left behind, regardless of their skills or ability. Focus & Concentration. Taekwondo gives students a clear structure and Well-defined grading examination system within which to develop their focus and concentration. Parents report great, calming results for high-energy children, especially those with ADD or ADHD. Self-Defense & Anti-Bullying. 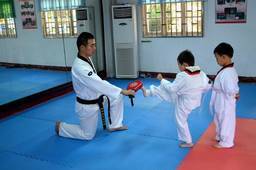 Taekwondo helps to define personal boundaries, develop skills and leverage personal energy for best results. Students who were formerly bullied learn how to own their worth, assert their personal boundaries and defend themselves if necessary. A Love of Learning. Learning is a critical life skill for just about every worthy endeavor. The Wyllie system of Taekwondo instils an insatiable appetite for learning in students. Presented in the right way, nothing is mundane or boring. Physical Stamina, Coordination and Good Reflexes. Taekwondo is both an art form and a sport. It supports the development of physical strength, fitness, flexibility while sharpening reflexes and coordination. This improves ability in almost every other sport or physical endeavour. Confidence & Self-Esteem. Knowing personal boundaries, increasing skill, achieving tangible goals while working outside your comfort zone all support the development of confidence and self-esteem. Self-Control. Working within a code of conduct & knowing how to control one’s own power and intensity is a skill student must master as their skill level develops. Master Wylie is one of the few master teachers in Australia. He is trusted by many public and private schools across NSW to teach in their schools and loved by the families of all his young students. Click here to check out our class timetable and come in for a first free class on us!